The stage is set for six Coffs Coast digital startups to go head-to head in a LIVE PITCH competition on Thursday 25 June for their share of $10,000 in cash and prizes. 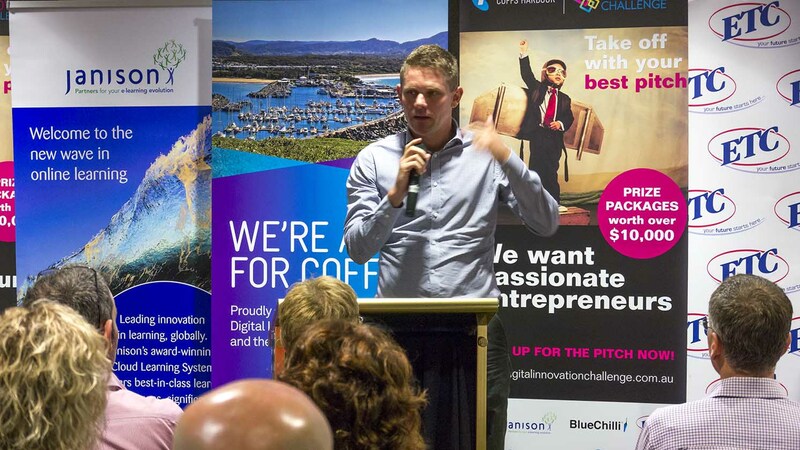 This is the inaugural live pitch as the culmination of the Telstra Stores Coffs Harbour Digital Innovation Challenge launched in March by the Shark Tank’s Steve Baxter. Over the last couple of months Coffs Harbour’s very own coworking space SIX DEGREES has been supporting local entrepreneurs to team up, workshop their concepts and hone their pitch skills at a series of events held at the space in City Square. Teams have been using the coworking space to develop their concepts and bounce ideas off the other members who have a broad diversity of skills and backgrounds. Local entrepreneurs were encouraged to submit their pitch on paper or video format and from this diverse pool of talent the top six finalists have been selected to pitch live to the panel of judges in Coffs C.ex on Thursday 25 June. The panel will include, among others, Alan Jones from BlueChilli a tech startup accelerator with offices in Sydney and Melbourne, Anthony Jephcott, Telstra Stores Coffs Harbour, and Wayne Houlden, CEO of local digital business Janison. The winning PITCH will receive $5,000 in cash along with a support package of mentoring and assistance designed to allow the entrepreneur to take their business to the next level. We encourage anyone interested to come along to the LIVE PITCH and be a part of the action. Maybe you have a concept you want to launch, get some ideas on how to pitch, find out what the judges are looking for, support our local entrepreneurs or get some hot tips on how to grow your own business. My Therapist is a way to find great therapists and also for great therapists to be promoted through particular user reviews. Our mission is to create a user friendly platform where people can know in advance the quality of a therapeutic service. Perhaps you are in need of a good massage, or need to find a trustworthy doctor – My Therapist will help make it easy for you. Local Farm Fresh is a new online platform and service that focuses on bringing locally produced food closer than ever to the consumer by creating hubs where farmers, food producers and buyers can connect with each other and with healthy, fresh delicious local foods. Social Ally is the next generation of digital interactive experience – delivered through a combination of high-quality content and real-time technologies. Social Ally aims to delight users with social, real-time experienced and deliver actionable, real-time analytics to businesses to help them fine-tune their content marketing. Sparky and Shady is about inspiring kids and assisting parents in creating resilient adults of the future. She provides workshops and afterschool classes for 7 – 15 yr olds to explore their sense of ‘self’, how to cope with problems and how to follow their dreams. Now she wants to launch this globally. PowZat Promos is a digital mobile channel where promotions can be created and posted within minutes, enticing consumer with new and up-to-date offers. Businesses have complete control to test the effectiveness of their promotions. The NSW Coastal Cycle Trail App and website aims to promote the trail to domestic and international cycling tourists. Assist cyclists to plan their trip, actively manage their routes and navigate whilst on a trip.